Knoxville, TN- The Florida Gators entered Saturday’s SEC showdown with Tennessee with many questions. Florida was starting a new quarterback after Luke Del Rio suffered a MCL sprain in his left knee against North Texas. It was also worth watching to see if Florida’s young offensive line could hold up against a better defense. Florida entered the game ranked number one in most defensive categories, and Florida defenders Jalen ‘Teez’ Tabor and Quincy Wilson engaged in trash talk about Tennessee’s eleven game losing streak to Florida during the summer and this in preparation this week. Florida exited Knoxville with perhaps more questions than answers. Florida dominated the first half of play, entering halftime 21-3. Tennessee came out in the second half and completely changed momentum. Tennessee scored 38 consecutive points before allowing a late fourth quarter touchdown. Florida’s offense appeared to become comfortable with the lead, and the play calling indicated the Florida coaching staff believed the defense would be able to stop the Tennessee offense which struggled in the first half. Austin Appleby, a graduate transfer from Purdue, started at quarterback for Florida. Appleby showed off an accurate arm in downfield passes as he completed four throws of 20 yards or more in the first half. In the second half, the offensive line broke down leading to a bevy of screen passes and incomplete attempts. Appleby finished with 296 yards and 3 touchdowns. Tennessee’s Joshua Dobbs struggled in the first half, but almost single-handedly dominated the second half. Dobbs finished with 319 yards passing, 80 yards rushing, and five total touchdowns. Florida raced to a 21-0 lead. Appleby completed touchdown passes to DeAndre Goolsby and Jordan Cronkrite, and Jordan Scarlett ran one yard into the endzone. Goolsby and Scarlett’s touchdowns were preceded by deep passes to Antonio Callaway. Tennessee’s Aaron Medley made a 28 yard field goal shortly before halftime. 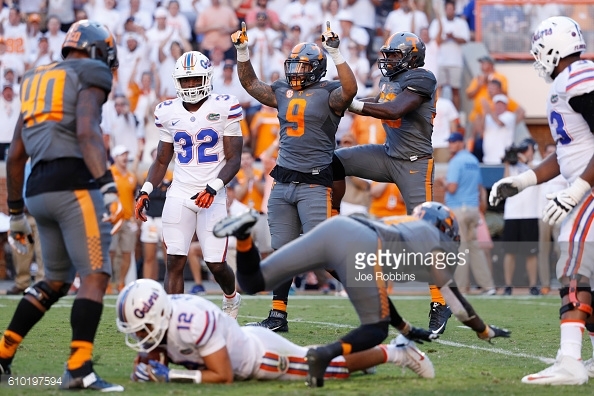 Tennessee scored 38 consecutive points between the end of the second and midway through the fourth quarters. Tennessee scored on a 23 yard reception by Jalen Hurd to bring the core to 21-10. Dobbs then found Ethan Wolf for 20 yards. Florida led Tennessee 21-17 entering the fourth quarter. Dobbs then found Jauan Jennings for 67 yards after a busted coverage by the Florida defense and the Volunteers led 24-21. Josh Malone followed with a 42 yard touchdown as Tabor slipped while in coverage. Dobbs capped the Tennessee scoring with a 5 yard touchdown run. Florida finally got on the board in the second half when Appleby found freshman receiver Freddie Swain for a ten yard TD.